Cook pasta according to package directions. Drain and rinse with cold water to cool. Set aside. 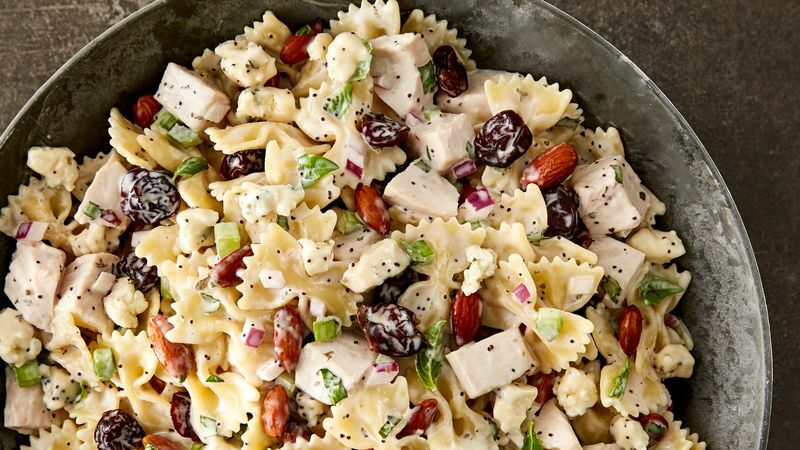 In a large bowl, add turkey, onion, celery, almonds, dried cherries, cheese and basil. Toss to mix. Add cooked and cooled pasta. Gently toss to distribute all ingredients. Add seasoned salt and pepper to taste. Add poppy seed dressing and mix gently to coat all. Add more dressing if needed. Transfer to serving bowl. Cover and refrigerated up to an hour before serving. Garnish with whole toasted almonds and shaved fresh cheese, if desired.